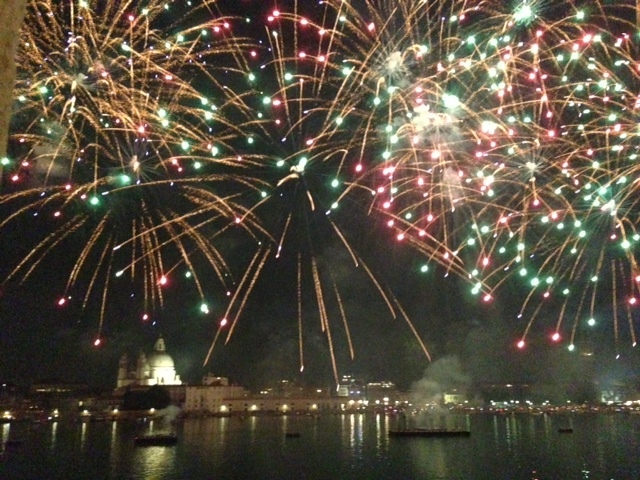 On the late evening of 21of July, 21 2013 incredible fireworks signified my happiness after the first day at the Biennale of Venice. The fireworks take place for centuries celebrating the end of the plaque epidemic of 1576- 1577. Every year thousands of people cross the bridge build for this one day over the Canale della Guidecca leading them to the votif church ” Il Redentore ” designed by Andrea Palladio. The revolutionary and extremely inquisitive architect Palladio also designed the most remarkable theater of the whole of Italy in Vicenza, not very far from Venice. The Teatro Olimpico at the piazza Matteotti in Vicenza has the most elaborate series of sculptures and reliefs reminding us of the role and task of every man and the greatness of works mankind can accomplish. In 1584 ” Oedipus Rex ” by Sophocles was the first play performed at the theater. Peter Ramos ( 1515-1572), Athanasius Kircher ( 1601-1680) and Robert Fludd (1574- 1637). All tried to contain all the knowledge of the world, from the universe to all aspects of nature, from the causes of everything to all kinds of form and matter, from man’s faculties to mathematics into a single scheme of things. In the end all of these attempts to understand and reflect ‘ all the world has to offer ‘ into a single system is in one way or the other derived from the Lurianic Schemes of the Kabbalah. Guilio Camillo published ‘ L’idea del Theatro ‘ in 1550 about the eternal aspects of all things claiming an all-encompassing system turning scholars into spectators. Camillo is represented in the 55th Biennale of 2013 by the work of Aurelien Fromant. She created the film Camillo’s Idea featuring a memory artist acting on the stage of the Teatro Olimpico in Vicenza. Formally the exhibit “Il Palazzo Enciclopedico ” is build around the idea of encompassing all of world’s knowledge in a single system or building and in the end in our own heads. The first is represented in full by Marino Auriti who filed a patent in 1955 for the design of his Palazzo Enciclopedico, as the curator Massimiliano Gioni puts it “an imaginary museum that was meant to house all worldly knowledge, bringing together the greatest discoveries of the human race, from the wheel to the satellite.” Massimiliano Gioni attempts to show with this exhibit, brilliantly, the importance to dream about one day succeeding in doing so and at the same time the craziness or insanity of even attempting a thing like that. Massimiliano Gioni is trying to be all-inclusive,, – as the exhibit’s goal is to leave nothing out-, to a level of complete exhaustion of the spectator. To me that exhaustive attempt of the curator is his brilliance. The exhaustion is the message. You literally feel ( your feet are hurting when you have seen all) completely drained out at the end of the exhibit and fully aware that there is no end to the knowledge of all of humanity. There is no way we will ever grasp all. The second building block or fundament of the exhibit is the Red Book ( finished in 1930 and posthumously published in 2009) of Carl Jung as reflection of all the things that go on in our heads. But not only that, the exhibit and therefor the curator appears heavily influenced by the book ” Man and his Symbols” conceived and edited ( in part) by Carl G. Jung and published three years after his death. The exhibit shows a multitude of attempts by artists and non-artists to fit all knowledge in symbols and symbolisms. Solo Scenes (1997-1998). The beauty of this installation is that it shows consecutive steps towards death all at once. Channa Horwitz showed examples of bringing all arts in a single system, ” Sonakinatography” combining sound, movement and notation in a form reminding of player piano rolls. Finally Hans Josephsohn surprised with his life long endeavour to study all variations possible in clay forms or sculptures from which the Golem might have been brought into-or to life. While the Arsenale showed the attempts to contain the world, the Giardini followed Jung in all kinds of attempts to encompass all that goes on in human life, the human mind in particular and what actions spring from it. Rene Iche’s death mask of the 34-year old Andre Breton , made 36 years before his death, links the Encyclopedic Palace with the vanitas-concept of living a life with permanent awareness of the mortality of humankind. Levi Fisher Ames produced little boxxes in 3’s that open up as oldfashioned travel trunks, in each of the six showcases a carefully wood-sculpted animal, mythical or real is shown. The whole animal world is shown as a cabinet of curiosities. Shinro Ohtake tries fervently and literally to collect all that can be found on earth to bind into books, he calls “Scrapbooks”, now amounting to over sixty of hundreds of pages. Each book is an individual reflection of what daily life offers on a given day by chance. Imran Qureshi captures ordinary people of current times into traditionally painted Mughal miniatures. These incredibly detailed and structured pictures reflect in some way the bridge between East and West. But human nature is best and most convincingly represented in the exhibit of Massimiliano Gioni by the work of Peter Fischli and the late David Weiss. The work of these artists I missed most was their video ” The Way Things Go ” (1986-7), creating in reality a Rube Goldberg-like machine, that in way says : the world goes as it goes and never an end comes to it. The 55th Biennale shows Fischli and Weiss’s masterpiece ” Suddenly This Overview” produced over 30 years, till Weiss death in 2012. Fisschli and Weiss bring humor into the realm of the highbrow ambition of encompassing all there is and there is to know. In a large room we are exposed to two hundred or so small, unfired clay sculptures representing the world in all its laughable grotestesque expressions of human activity. We get to see: Dr. Hofman cycling home after taking the first ever dose of LSD, Einstein’s parents in postcoital repose, having just received their genius son, and alike. (an) idiosyncratic anthology celebrating the world in all its ungraspable variety and profusion.